To coin a phrase it's beginning to look a lot like Christmas around here. The Byers Choice Carolers are out and in fine voice and today, 6th December in honour of Old St Nick, the Santas arrived laden with sacks of toys and goodies to decorate the dining room mantlepiece. More about them later in the week. Like everyone else I have boxes and boxes of Christmas "stuff" in the attic, (not all of it is displayed every year) it's always a joy to unpack the boxes and take a nostalgic trip down memory lane as I decide what will be displayed where, whilst listening to Christmas music CD's. Christmas Carols from Saint Georges Chapel at Windsor Castle is a particular favourite. 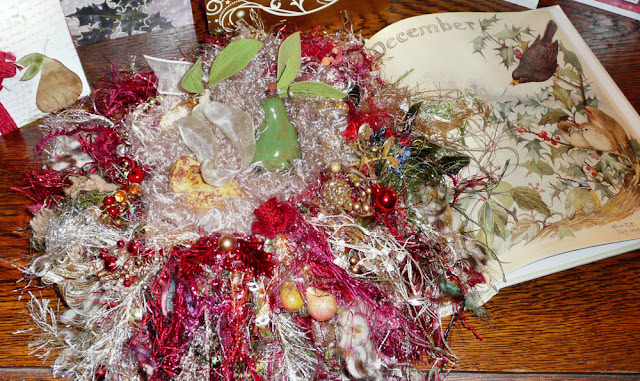 Each year I limit myself to buying just one new item to hang on the tree but when I saw the beautiful hand made, limited edition, 2011 Partridge Nest created by Vicki in her Sacred Yarn Room (ably assisted by her very good friend Mary) on her blog 2 Bags Full my heart did a little flip! 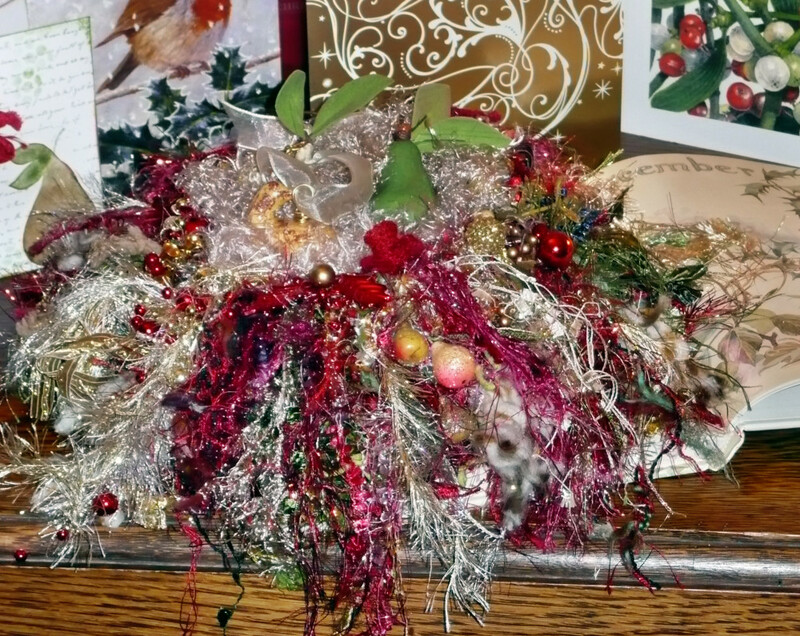 "The charitable portion of the proceeds from the sale of this nest will be donated to our local Ronald McDonald House. So many families can't be at home during the holidays because they have sick children in the hospital. These funds will be used to help make their Christmas a little brighter." I wanted to buy one even more. 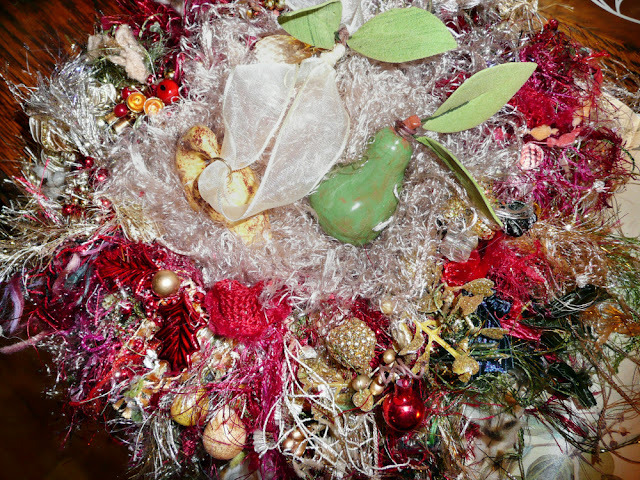 Sadly, all the nests that Vicki had created were already spoken for by the time I saw them and I resigned myself to waiting until Christmas 2012 for my Designer nest. You can imagine how delighted I was when Vicki emailed me to say that one of the reserved nests had not been picked up and it was mine if I wanted it. In keeping with the Pantomime season it felt like "Cinders you shall go to the ball!" 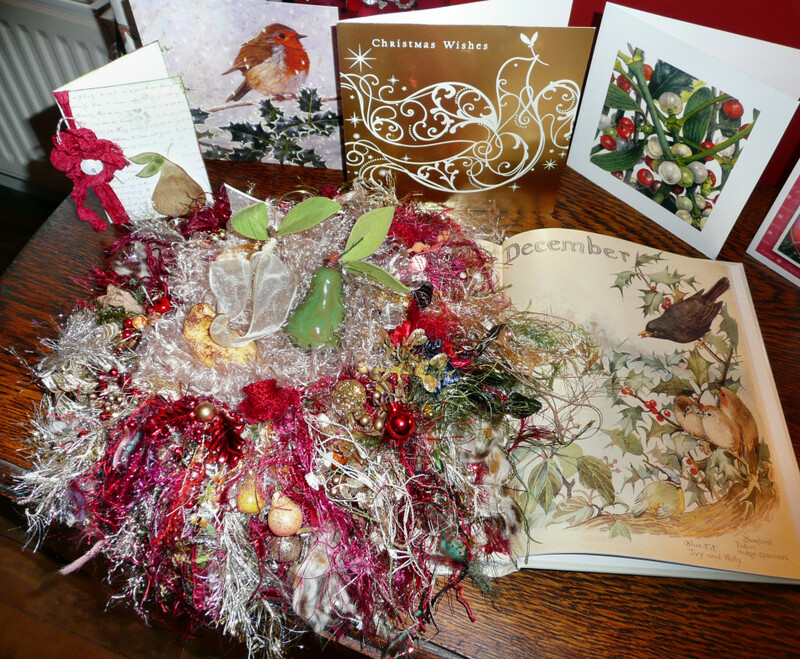 The beautiful hand crafted Partridge Nest arrived today and I have spent a very pleasant afternoon fluffing my nest and finding the best place to display it, in all it's gorgeousness. With the nest came a wonderful glazed pottery pear to sit in the centre of the nest and a partridge ornament to hang on the Christmas tree, these were both made by Susan Jenkins another talented friend of Vicki's. Click here to find out more about Vicki's amazing hand made nests and perhaps get your name on the list for next year! Maggie, this is a gorgeous nest and so very unique! I also love your book and Christmas cards on the table. Thanks for sharing this website with us; I'll have to check it out. Have a blessed Christmas season. Your Christmas enthusiasm has arrived in force Maggie, lovely post. I'd like to crawl right into that nest! I'll bet you had fun trying it in many different places in your house. The rich colours, the texture - all so very beautiful. Hi Maggie. What a gorgeous nest. I have never seen one before but I can see you wanted one. It is so special.Love the colors. Hi Maggie - you captured the nest beautifully! I love how you have displayed the nest with that gorgeous bird book! Oh it is incredible! 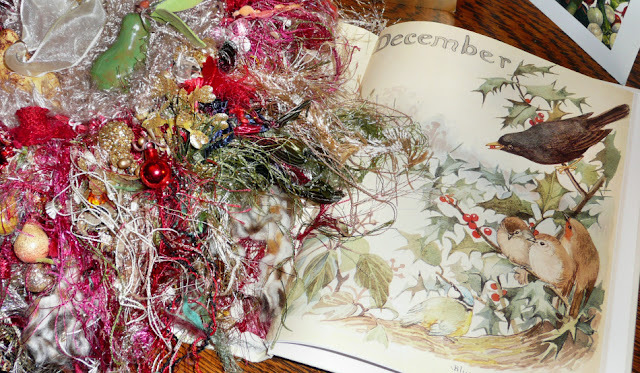 I would just love to see your entire house right now - I am sure that it is a vision of Christmas loveliness! I am so happy that you love the nest. Thanks for sharing the photos (beautiful photos!!) with all of your friends. How lovely!!! She is such an incredible artist! And lucky you that a nest became available after all. Wonderful cause. Beautiful. Definitely a win/win situation! What fun! That is gorgeous! Hi Maggie! It is a wonderful nest for a even more wonderful cause! It must be so hard for families that have children in the hospital during the holidays. Thank you for sharing this at my Bunny Hop Party! The nest is so beautiful and unusual. I'm wondering about the book in the photo. 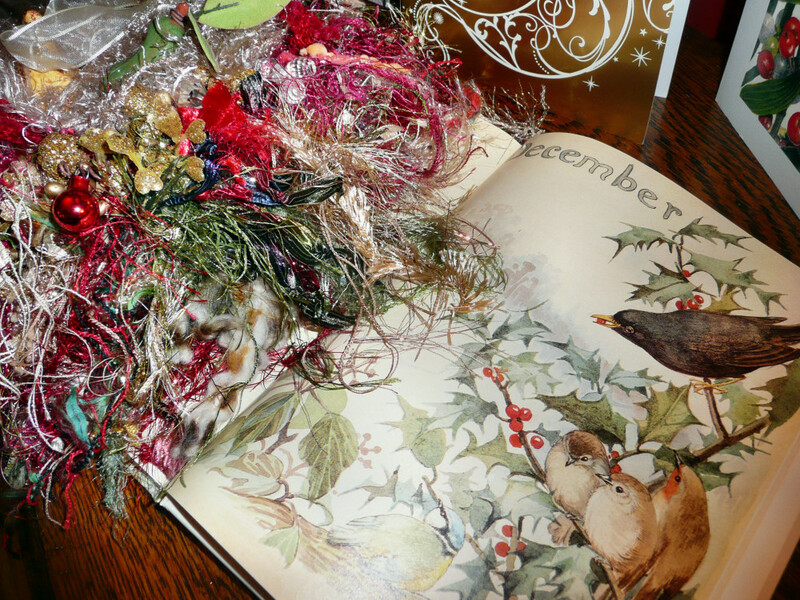 The page reminds mee of "The Country Diary of an Edwardian Lady". I have a collection of a Byers' Choice Carrolers too, and always enjoy them at Christmas. Hope you had a fun St.Nicholas Day. That nest is so beautiful ... I've never seen anything quite like it. It's so nice that you were able to help out a local charity as well... makes it all the better! Hi Maggie, I am so enjoying your beautiful Christmas decorations. 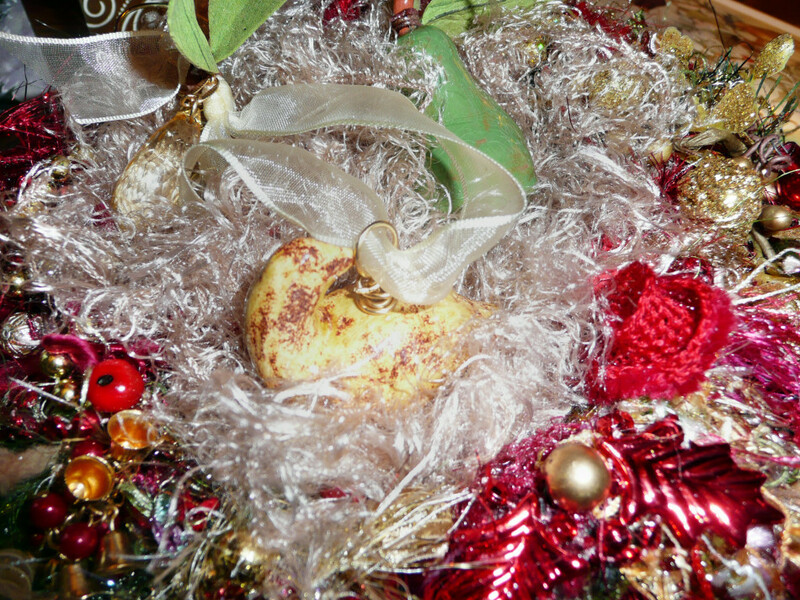 I have to say my heart did a little flip too when I saw your partridge nest. Absolutely beautiful! How wonderful a portion of the proceeds are donated to such a worthy cause. I love how you have it displayed on the lovely book. Oh how I would love to knock on your door for a visit at Christmas, I'm sure your home is amazing. 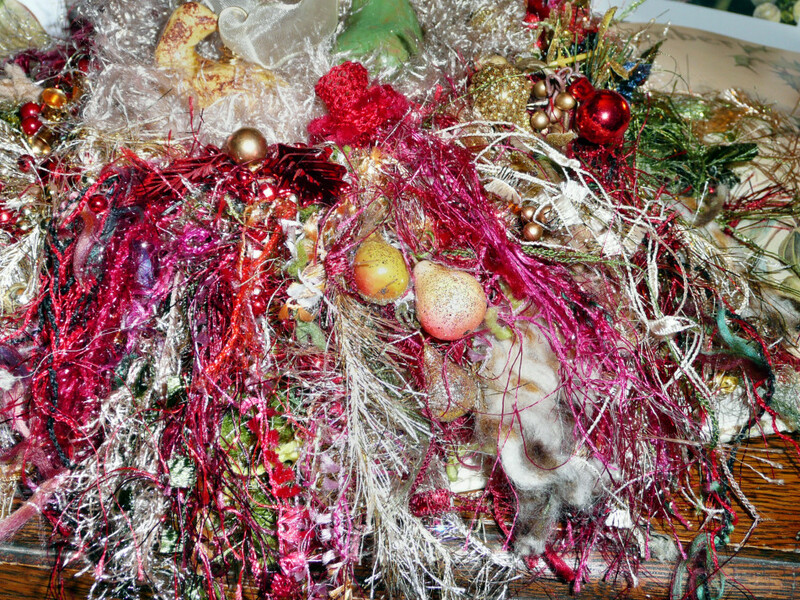 What a gorgeous nest! It is truly a work of art. I like how you have it displayed on the book, too. You are a lucky duck that you were able to get one since they are in high demand (which is totally understandable considering how gorgeous they are).